Last time I visited Barcelona I made a mistake and didn’t bring my longboard along. This time I finally got a chance to fix it. Now, my only concern is to park the yellow car in the center. This is not trivial issue, because by definition, you can’t move by car in Barcelona. Why all the pedestrians, cyclists and scooters appear out of nowhere to block the only narrow one-way street available? Here you can not turn, there is no space left and hence no turning back. I am forced to head the opposite, completely wrong direction. Forget about moving by car. In the end with a speck of good luck I find a place right on the beach. I plan not to move an inch for a few days. This is the time for longboarding. My first route leads along the coast, from the Bogatell beach, through Barcelonetta and up to the Columbus monument. The seemingly tranquil beach area starts to fill up with sun-longing tourists from early morning hours. There is also correspondingly larger number of cars in the parking lot. I even get the impression that each of the beach goers has brought two cars. 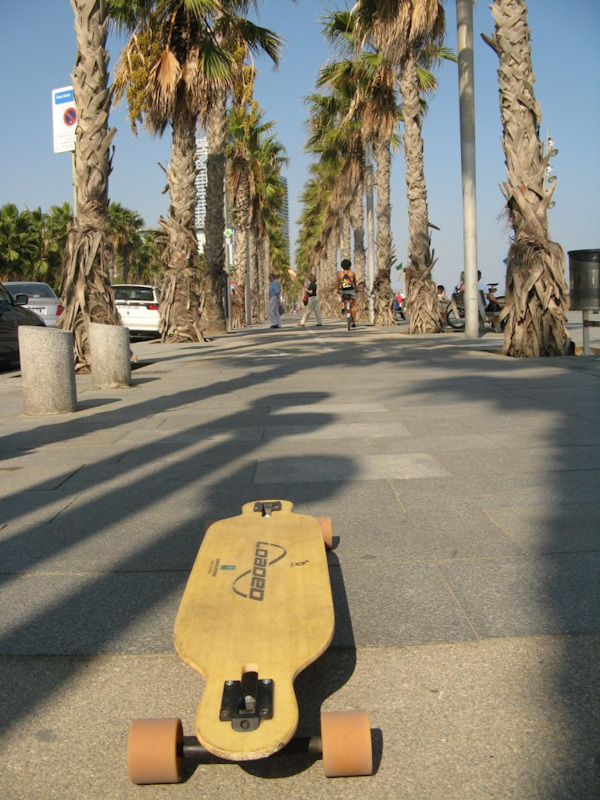 Did I mention that Barcelona is the most welcoming city for skateboard sports in Europe? The supreme surface made of hard wood, or cement, or plain, but good quality asphalt gives you the freedom to move around the center. Longboarding is on the winning position compared to walking. Especially during the midday when traffic is low, you can easily move along the street between cars. Most of the alleys have a separate bike lane. Some of them also include a wide promenade. Cruising Sant Joan by the Arc de Triomf and then the whole length of Gran Via is a dazzling beauty. During the initial two days I cover 70 kilometers on my Dervish. I move along at neck breaking speed next to the constantly renovated Sagrada Familia cathedral and then I slowly climb up to the lookout in Park Güell. I stop for a piece of Spanish pizza and echilada con carne picante, or an Argentinian pastry filled with spicy meat. Relaxing is the relief served by coastal breezes and almost noiselessly rolling bearings in my Loaded Dervish longboard. Should it get too hot in the sun, I plunge into the refreshing waters of the Mediterranean.